I've been holding back on writing about Nebraska's Catholic churches for quite some time. I wanted to wait until I acquired a few history books on the subject before I started writing! Interest in beginning a Catholic parish in Wahoo can be traced back to 1877, when a local group of Catholics began planning to build a church, named after the patron of their former country, Bohemia. Construction on the present neo-gothic church began in June of 1920 and was consecrated in September of 1923 by Bishop James Duffy of Grand Island, as the Diocese of Lincoln was without a bishop at the time. Note the cornerstone inscription, written in Czech and English. The interior of the church has undergone a number of renovations throughout its 85 year history, most notably in the 1970s, which resulted in the removal of the old altars. Compare the two photos, the top being taken recently and the bottom dating from the 1940s. It is rumored that there is interest in acquiring a set of old altars to better compliment the architecture of the church. A complete cleaning and restoration of the art-glass windows is currently underway. A unique capital helps support the choir loft. This is amazing to see! 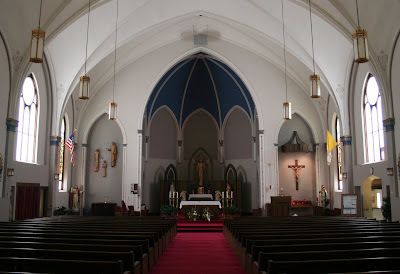 I happened to be looking for pictures of the church I grew up in as a kid and here it is! It's amazing to see here! I would have never guessed that anyone outside of Wahoo would have taken an interest. An interesting fact, my great-great grandfather was a carpenter who help build it. His name was Joseph Vanek. Thanks for the additional information, EJ! I'm glad you're enjoying what you see! Keep checking back, as I plan on doing a post on the windows at St. Wenceslaus. They look amazing after their cleaning and restoration! I also grew up in Wahoo Ne, and went to Cathlic school back in 1956. I remember going to church at St Wenceslaus. My Aunt & Uncle lived right next door back in the 1950's & 1960's. EJ my aunt knew some of the Vaneks, she mentioned when she lived in Prague there was a Vanel that worked at the bank there, but that was many years ago. She is now with the Lord. I also remember a wooden Bridge that was a overpass on 2nd St 3 blocks West of the Church. I been trying to locate some photos of it but havent had any luck.